An invitation from the Goddess. I was twenty-seven when I met Shri Mataji. Shri Mataji, along with Her brother Baba Mama, came to my house in 1982, in Delhi, in preparation for a wedding between our families. It was a tradition that the bride’s family should please the groom’s family and that, until the marriage took place, they were to be catered to with full devotion and love. My wife and I were entrusted with the responsibility to look after the groom’s aunt and Her brother – that is, Shri Mataji and Baba Mama. That was indeed the biggest luck of my life. At the time I don’t think I was aware of this great good fortune. Shri Mataji immediately took charge of both me and my wife and started to tell us about Sahaja Yoga and its amazing powers. I began to wonder, 'Who is looking after whom? Right from the beginning, Her attention was on my Vishuddhi. She started to work on my left Vishuddhi, as I used to often be very sad. She would ask me to sing songs to Her. Baba Mama would silently sit and watch how She worked on me. In 1986, Shri Mataji very sweetly asked me if I could drive Her to Rajasthan and I was delighted. I was quite surprised that I wrote almost twenty-four songs in just a few days, while in Her presence. Finally, we drove back to Jaipur, the capital of Rajasthan. On the way, She asked me if I could go with Her to Mumbai, as She had no one accompanying Her on the flight. She told me that I would have to sleep outside Her room, as She was staying in a one bedroomed flat. She enquired if I would be comfortable and I was simply thrilled. When Shri Mataji first met me in 1982, She worked on my left Vishuddhi, and just prior to our departure for Mumbai, something extraordinary happened. She was sitting with about forty yogis meditating in front of Her, and I had just entered from the opposite door into the big drawing room of Mrs. Pardal’s home in Jaipur. I could see Shri Mataji directly face to face. Her eyes were closed and there was complete silence. Then all of a sudden the candle flame on the opposite wall flickered very hard and I heard a swish kind of a sound coming from the left of the room. The moment I turned towards it, I saw a big ball of fire entering through the wall, and it circled around the room so very fast that in a jiffy, and in a wink of the eye, it went through to the other side of the wall and disappeared. Its light was still lingering in the room as I gazed towards this miraculous happening. At that very moment, my eye met Mother’s, as She suddenly opened Her eyes and looked directly into mine. She smiled at me and shut Her eyes again. None of the forty yogis in the room saw this miracle. They sat unmoved, as if nothing had happened. Soon after, when Mother sat relaxed in Her chair and the yogis had got up and were moving around, I went and asked a few of them if they had seen anything. No one acknowledged it. I could not contain myself and went to Shri Mataji. Before I could even utter a word to Her, She whisperingly told me, by cupping Her fingers around my ear, not to panic, as it was the Goddess Vishnumaya. Then She emphasized that it was my own Vishnumaya that I saw, having just finished with my clearing, and that I was now free from guilt. She told me that I could now freely express myself and I need not fear anyone. She also said there was a lot of potential in me which could be tapped and She was working on it. I ran to another room, unable to contain my joy. I returned after a few moments and sat at Mother’s Feet. I had brought a paper and a pen and was writing a poem and reading it aloud to Shri Mataji. She closed Her eyes and began talking in prose and I jotted down every word She spoke. It was filling up the words of my poem and at the end of it a beautiful song was born – Jeevan Hai Yeh Apna. She then asked me to sing it, which I did. ‘It is a true happening in Sahaja Yoga and that is how the transformation happens. You must sing it to all the new people,’ She commented. Later we travelled in the plane from Jaipur to Mumbai. In the plane She would suddenly fall asleep while talking and I would then start writing poems. She would wake up and enquire how much I had written, then go through the poem with me and correct it. The miracle was that when I narrated the poems back to Her, I would actually sing them as if the music was composed already. She liked the compositions and told me that the ragas I selected were most appropriate to the subject matter of each poem. Amazingly, I had not a clue about it until She actually told me. This photo was taken at Jaipur in 1986. I had driven Shri Mataji from Jaipur into the interior of Rajasthan, as She went looking for artefacts to put in Her house in Pratisthan at Pune. In the photo Shri Mataji was seated at the Royal Palace of the Queen of Jaipur. It was the festival of Gangaour (Shri Ganesha and Shri Gauri Mata). At the time of the photo Shri Mataji was listening to my musical compositions, which were created during the journey there. There were many occasions when Shri Mataji would ask me if I had written something new. So every time when I would go to meet Her, I would make sure I had a new song ready and She would spontaneously ask me to sing it. She would ask all the yogis present to listen and then She would explain its meaning. What intrigued me most was Her asking me to sing my new song before Her each time it was freshly written and composed. It used to happen very spontaneously with me - the words would just begin to flow – at times, words of which I myself did not know the meaning. Yet Shri Mataji always knew when the song was ready for Her to listen to. I too happened to be around Her just at those moments. Mother once commented that my Swadisthan chakra had opened and pure knowledge was flowing through me. The best compliment Shri Mataji ever paid to me was when She named me Roshan – the enlightened one. She once told me that I had the complete knowledge of Sahaj Yoga and She was very happy that I would be able to now write, compose and sing Her message for the whole world. I am still trying to understand what She really meant by that, but if God is to be seen on Earth today, it is Param Pujyaniya, Her Holiness Shri Mataji Nirmala Devi. 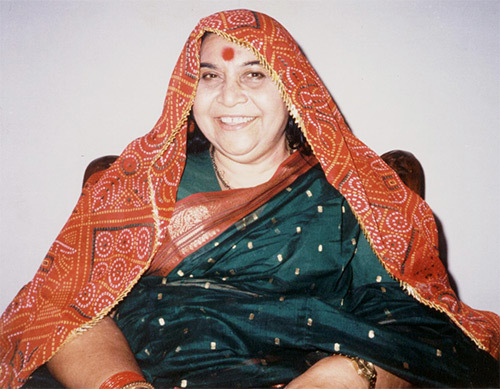 The recording of the bhajan tape Roohani Roshani was important because Shri Mataji personally supervised its making – right from the compositions, poetry and the pre-recording puja advice. At the recording time, She put Her attention to it and when it was recorded She checked its quality and made me redo certain portions where She felt it needed correction. I still remember Her remarks after I phone Her to check She had heard the whole album, before it was formally released. I was completely dazed with Her words, spoken so very softly over the telephone. At that time, I was staying at a yogi’s home in Mumbai. After the phone conversation the yogi put flowers around his phone and did a small puja to it. He would not let anyone call from this phone, as it had just been vibrated with Mother’s voice. It was such a thrilling moment for both of us. This photo was taken in Mumbai in 1988, after Shri Mataji had heard my first professional audio recording, Roohani Roshani, named by Shri Mataji. 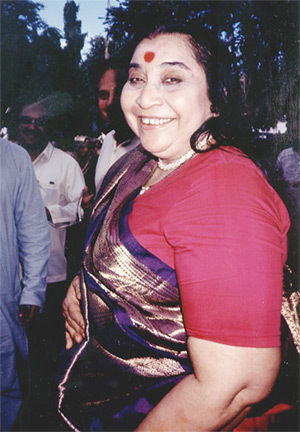 It was the 10th of December 2002 when I had a chance meeting with Shri Mataji. ‘One day even I will have to leave this mortal being and it is you people, the Sahaja Yogis, who will have to keep this lamp of love glowing in everyone’s hearts. You will have to take the responsibility to lead all seekers of truth to their ultimate fulfilment through your own Self-awakening,’ She said. Her words left a great impact on me. I was spellbound and a great sense of urgency engulfed me. I shared with Her my dream to bring all the poetry and music She had nurtured in me and the sweetness She had endowed to my Vishuddhi, to collectively reach out to the whole world. ‘Mother, please do something so unique that Your vibrations from these bhajans will provide instant meditation to all,’ I implored Her. She told me that my work was already done and reminded me of Her golden words when, in 1989, She had predicted this would happen. ‘Now, the time has come and nothing can stop it from happening. So go ahead. You have My Anant Aashirwad (eternal blessings),’ She said.